But the England manager also challenged the younger members of his squad to step out of Rooney’s shadow and show they have the leadership qualities to drive the national team forward. Southgate, who has given first call-ups to Watford midfielder Nathaniel Chalobah and Leicester defender Harry Maguire, had planned to meet with Rooney to discuss selecting him for the World Cup qualifiers against Malta and Slovakia after leaving him out of his last two squads, only to be told by the 31-year-old he wanted to focus on his return to Goodison. Nevertheless, Southgate spent 30 minutes trying to persuade the Everton star and said the door would be left open in case of a change of heart. “Have I seen players change their minds? I think we all have,” he said. “Do I see the value of a senior player and what he may add in terms of experience and developing some of the other players? Definitely. “Part of that question should go to Wayne – you’ve got to respect his decision and the thinking behind that. “But it is a good question. We have to see where he was at, where the squad was at, where everything else was at. It would be foolish to say no, because anything is possible. 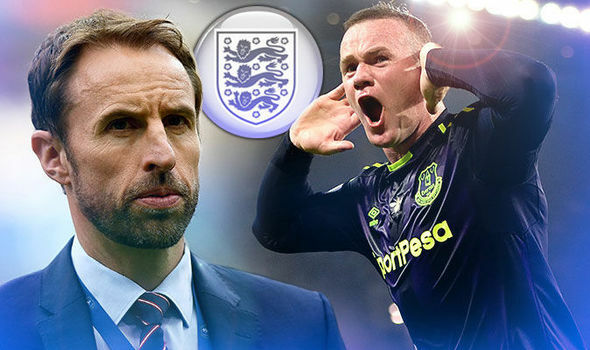 Southgate backed plans, reported in yesterday’s Daily Express, for the FA to stage a tribute to Rooney at Wembley in the coming months insisting that his 119 caps – the most for an outfield player – and his England record 53 goals deserve celebration. “I know already there is discussion around that and absolutely we should be recognising his career with England and showing appreciation,” he said. With Joe Hart’s position as first-choice goalkeeper in jeopardy from Jack Butland, Southgate will be looking to Gary Cahill, Harry Kane and some of the other younger players to show leadership qualities from the moment the squad meets up on Sunday. “Wayne’s been somebody it may have been easy to hide behind for people,” Southgate said. “He’s the one who has carried that burden. That’s been unfair on him. Now everybody has the chance to take the mantle. “Others have to grasp that initiative and responsibility and it is an opportunity. If we are going to be an outstanding team moving forward then you need players who are going to step up in the big moments. If Rooney remains in retirement, Southgate could even contemplate going to next summer’s World Cup without a designated captain at a major tournament for the first time. “I don’t know is the honest answer,” he said. “I still look at other countries who pick the most-capped player on the day as the captain. “The more important thing is that the culture around the team is of people prepared to take responsibility and influence others in a positive way.